This is the best ad I’ve seen in months. In fact, the Timberwolves have won a playoff series only one time in their 21 years of existence. Thus, acknowledging the mistakes of the past is certain to resonate with a fan base more prone to eye rolling than belief that “this will be the year”. But, the genius of this approach begins and ends with the sign. 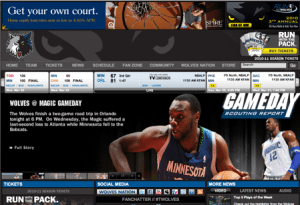 The ad asks us to visit timberwolves.com/manifesto. Doing so reveals finely honed, groan-inducing marketing copy that clumsily tries to build a bond via forced humor and shared humiliation. 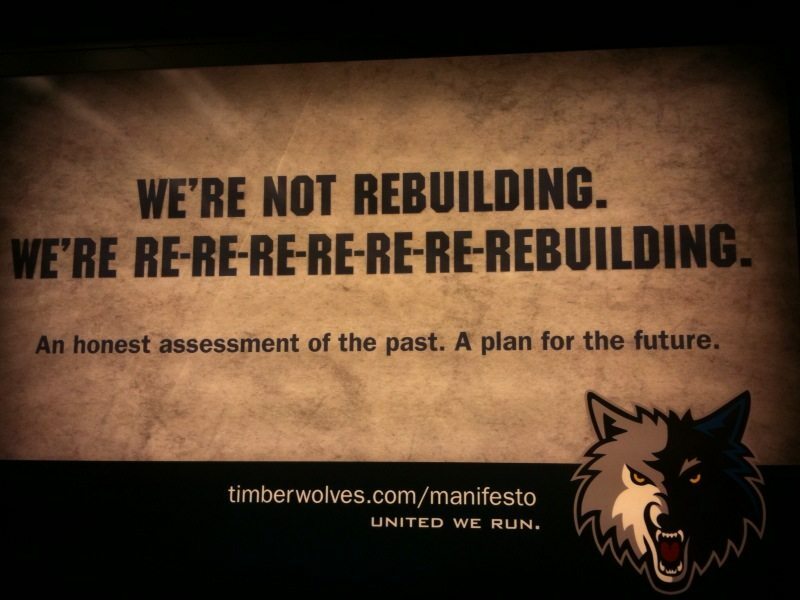 A visit to the main T-Wolves Web site finds absolutely none of the humility and forthrightness that made the original ad so compelling. Instead, it’s the standard sports franchise drivel, including ads for home equity loans above the team logo. Yep, that’ll get fans in the seats. But, the team does reference a series of social media outposts via a tiny murderers row of icons (my favorite is “Linkedin..coming soon”. So, I turned to the team’s Facebook page, where NBA rules have not yet been codified, and team’s have more leeway than they do on the official Web site. 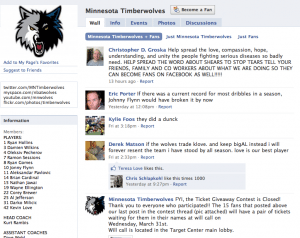 The Timberwolves on Facebook page has no mention of a manifesto, not even a link on the Info tab. Why isn’t the Manifesto it’s own tab? And perhaps most inexcusably, they haven’t even gotten a Facebook URL, and now facebook.com/timberwolves and facebook.com/twolves have been poached. But, facebook.com/mntimberwolves appears to be available, and their Twitter handle is @mntimberwolves. They need to snap up that Facebook name pronto. In the team’s defense, they do have a nicely executed Events tab, and the Wall seems to be pretty active, with a variety of contests for fans. But, it’s widely disparate content usage across social outposts that’s the real mystery. On Facebook, there are just six videos total – the most recent added MORE THAN A YEAR AGO. I couldn’t believe it, given how many video assets a professional sports team has. I know they have restrictions on posting game footage, but there’s a lot more that can be done. So, I peeked at YouTube. Voila! 213 videos on YouTube, the most recent just five days ago. It’s a good mix of coach-speak, highlights, community service footage, and cheerleader features. What I can’t fathom is why those videos aren’t added to the Facebook page every time? The Facebook page has a not-too-shabby 13,000+ fans, but most of the YouTube videos have just a few dozen views. Unfortunately, the same lack of content leverage applies to photographs as well. The team has a lot of photographs on Facebook (and also some on Flickr). However, the photos in each location appear to be different, and the file names on Flickr are straight from the camera (tough to rank in search engines when your photo is named “CIMG1537”). I didn’t start out looking to slam the Timberwolves’ social media program. I started out writing a post about a fantastic ad. But then I pulled on a loose thread, and the Timberwolves’ messaging sweater unraveled instantly. First, if your ad agency is going to come up with a nifty new concept, you have to support it throughout your digital world. In the age of the real-time Web, when every customer is a potential reporter, and there’s no place for brands to hide, you cannot rely on sloganeering. If you’re going to run ad that says “quality is job 1” then quality better damn well be job one, and every place you have a presence online better sing from that same metaphorical hymnal. Second, if you’re going to invest in a bunch of social media outposts, even if you don’t have a clear social media strategy, you should take every opportunity to link them together. The videos aren’t annotated to drive traffic to Facebook. The YouTube channel is barely mentioned on Facebook. The Twitter background includes zero evidence of any other outpost. Third, if you’re producing content, atomize it and distribute it as widely as possible. If you have a photo gallery, it should be everywhere. Your Web site. Blog. Flickr. Facebook. Linked from Twitter. At a minimum. Social media takes too much time and effort to not use every bit of leverage at your disposal, and creating content and uploading it in just one place is a tragic lack of synergy. Sorry to the T-Wolves. I hope they improve on the court and online.